Colorado Wing Civil Air Patrol had a very special luncheon guest for this year’s Wing Conference. Former CAP member Maj. Ed O’Brien is an award-winning journalist who exposed pedophiles and a historian who contributed evidence of James Shaw’s theft of Civil Air Patrol artifacts during the 2011-2012 investigation reported in the Dayton Daily News. O’Brien became infamous in CAP circles when he reported misappropriation of donated historical items that would have undermined confidence in the Civil Air Patrol right before the Total Force announcement. For speaking out so firmly against thieves and exposing the cover-up commanders Maj Gen Chuck Carr and Col Richard Greenwood after the dismissal of Inspector General Merle Starr, Maj O’Brien may have felt the spectre of reprisal persecution coming his way. Four years later, in keeping with the 75th anniversary theme, Major O’Brien enthralled COWG members with a brief presentation on pre-World War II aviation, General Curry and the early days of CAP. 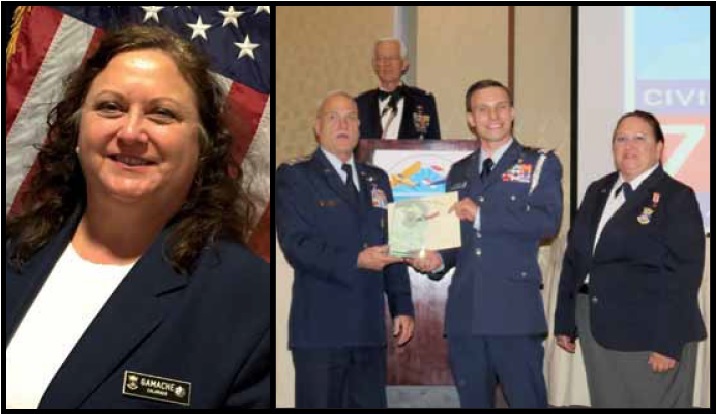 “We could have listened for hours to his retelling of the history as it was so interesting,” stated Maj Mary Cast who serves as COWG Director of Aerospace Education and as the Commander and PAO of the Foothills Cadet Squadron. So many hats in a Wing and a Region that is known to be falling apart. “Col. Gamache presented Maj. O’Brien with a framed picture as a token of appreciation after his talk,” concluded Maj Mary Cast. Be the first to comment on "COWg Gamache Hosts Former CAP Major Ed O’Brien"